“When they come for my gun, they will have to pry it out of my cold, dead hands,” is a common refrain I often hear from the Neo-Cons when there is a threat, credible or otherwise, that the US government is going to take their firearms. This is not a question they are comfortable with, if only because the intent of their saber-rattling was to imply they would fight to keep their weapons, and win. Nice fantasy. It’s not happening. …they will take your guns, and no, all your Second Amendment bluster aside, you are not going to do anything about it. If the federal government decides to disarm the public, and when the increasingly-militarized police force rolls down your street after a not-so-subtle request that you kindly turn over your firearms and ammunition “for the common good,” it will be nothing less than suicide by cop to do anything other than what you are told. The militarization of US police forces is ongoing and escalating. Many cities and towns now own tanks, armed personnel carriers, even attack helicopters, and almost all are outfitted with military weapons not available to the general public. And, it is not just your hometown cops who are getting new boy-toys. The military itself is buying up weaponry not just for use in the current or next scheduled war, but to deal with the likes of you, citizens who don’t seem to understand that the Bill of Rights has been overruled, and that specifically includes, but is not limited to, the right to protest and engage in civil disobedience. Also ignored (as if it didn’t even exist) is the Posse Comitatus Act of 1878 which generally bars the military from law enforcement activities within the United States. And, they are not just arming cops and weekend warriors for domestic purposes. Active duty Marines are now being trained for law enforcement operations all over the world (of which the US remains a part) specifically to deal with civil uprisings, and the US government knows that civil uprisings are coming to a town near you just as soon as the fantasy of a healing economy is shattered, the US dollar fails, and unemployment goes to 30%+ in real numbers. And, to you tough-talking Neo-Cons with your AR-15 rifles and a few thousand rounds of ammo, here is the reality: they will take your guns, and no, all your Second Amendment bluster aside, you are not going to do anything about it. You are not going to take on a platoon of Marines with state-of-the-art automatic weapons and the best body armor you cannot buy protected by armed personnel carriers and attack helicopters unless you choose to die that day — for nothing. You will either be in the country or out, and if you are in, you will stay in and you will comply. That is your choice… for the moment. Ed. 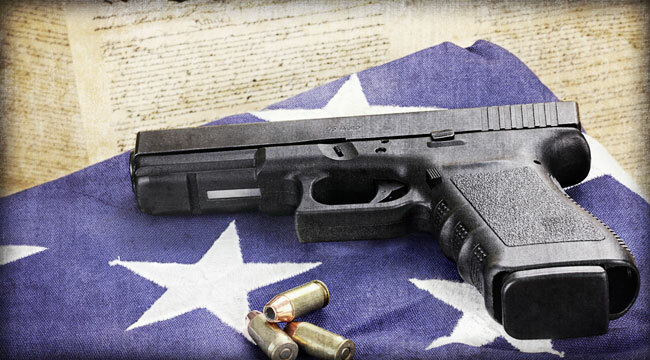 Note: The debate rages on… And whether you agree with Mr. Krager or not, the reality of what will happen when the feds come for your guns is going to be difficult to stomach. We suggest you prepare. Sign up for your FREE subscription to The Daily Reckoning, right here, and get all the info on how to do that, every single day.